In case the name is not familiar (if you're an editor it should be), Walter Murch is the winner of multiple Academy Awards for his work as a film editor and a sound designer -- he coined that term. Among his many notable credits are "The Conversation", "American Graffiti", "Julia", "Apocalypse Now", "The Godfather" (parts II and III), "The Unbearable Lightness of Being", "Ghost", "Crumb", "Romeo Is Bleeding", and "The Talented Mr. Ripley". His first Oscar was for "Apocalypse Now" and he won unprecedented double Oscars for sound and film editing for "The English Patient". As an editor and sound man he is one of the few universally acknowledged masters in his field. Murch sent ripples of surprise through the editing community (but not those of us who know its capabilities) when he decided to use FCP to cut Anthony Minghella's "Cold Mountain," a $100 million Miramax film shooting on location in Romania (due out Christmas 2003). Having been told about this book by a director for whom I was editing a film, I sat down to read it with a red pen at hand so that I could mark salient passages. I never touched the pen because had I used it I would have marked almost everything. I liked it from page one but by the middle of page eighteen I came to believe that Walter Murch's "In the Blink of an Eye" will become to film/video editors what Strunk and White's "The Elements of Style" is to writers. This is not a "how to" book in the sense of specific techniques, a manual, if you will. It is much richer than that. Murch discusses the art and craft of editing on the levels of meaning and emotion. In doing so he will influence your work for the better as he has mine. Even if one were not an editor this little book would be worth the time. It's filled with insights on human behavior, wonderful anecdotes about movies he has worked on and people he's worked with. Murch has an eclectic intellectual and artistic background and the book is laced with instructive metaphors drawn from painting, music and literature and spiced with his lively sense of humor and fun. The second half of the book is a look at the history and future of digital editing. I expected to skim through this part thinking it would be data driven and dry. Wrong! The gems of wisdom embedded in his commentary on the pleasures and pitfalls of the new editing technologies are worth the price of the book many times over. I did my first editing on film with Moviolas and Steenbecks then moved much later into analog videotape and three years ago into FinalCutPro. What Murch has to say about the strengths and weaknesses inherent in the various methodologies is brilliant and unique. I promise that it will make you reevaluate the way you work and, almost certainly, improve your final output. I'm tempted to go on and on about this book, give you more samples and go into detail about how it has already affected my work. But as you see I have resisted this temptation. I will conclude by simply saying that if you are serious about your craft, buy and don't just read but study this book. "Your job is partly to anticipate, partly to control the thought processes of the audience. To give them what they want and/or what they need just before they have to 'ask' for it -- to be surprising yet self-evident at the same time. If you are too far behind or ahead of them, you cause problems, but if you are right with them, leading them ever so slightly, the flow of events feels natural and exciting at the same time."... Walter Murch. Ben Bryant has acted in prime time TV shows and commercials and on Broadway, sung at the Metropolitan Opera and in Jazz clubs, produced over 1,000 TV commercials and dozens of industrial films, worked as First AD on features, produced and directed over fifty TV shows. Now he shoots, directs and edits video productions of all varieties. 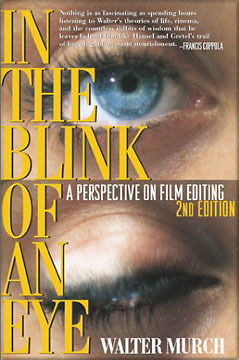 You can purchase 'In the Blink of an Eye: A Perspective on Film Editing' from the lafcpug store.